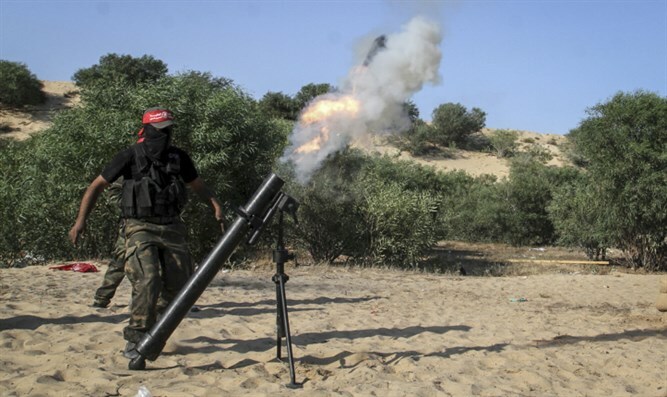 Terrorists in Hamas-ruled Gaza Strip launch mortars at Israeli forces stationed along border. Israeli soldiers operating along the border with the Gaza Strip were targeted Thursday afternoon by terrorists in the Hamas-ruled coastal enclave who fired mortar shells at the IDF unit. According to an IDF spokesperson, the incident occurred along Israel’s security perimeter along the border with the southern portion of the Gaza Strip. No injuries were reported in the attack. Earlier on Thursday, Israeli aircraft opened fire at a Hamas cell in the Gaza Strip as it was launching balloons attached with incendiary devices towards Israeli territory. Sources in the Gaza Strip claimed that one terrorist was killed after an Israeli drone fired two missiles at the terror cell. Three other terrorists were reportedly injured in the attack.